People take many roads to war tax resistance. Most are motivated by a combination of reasons and actively work for peace in many other ways too. If you consider your motivations this will help you determine your method of resistance. Refusing to pay federal income taxes is an act of civil disobedience with a long history in the U.S., where the best known war tax resister was Henry David Thoreau. His refusal to pay his poll tax, which had to be paid before you could vote, was made in protest to the Mexican-American War and earned him a night in jail. The experience led him to write his influential essay, “Civil Disobedience.” While those of us who refuse to pay war taxes believe our refusal is just and imperative, and some of us cite international law to back up this belief, the government considers the refusal to pay these taxes to be illegal, and there are potential repercussions through the IRS collection system. For most of us who resist, the dire consequences of voluntarily paying for war are far worse than what the IRS and government can do to us. War tax resisters are not out to enrich themselves by evading taxes. Some of us live below the taxable income limit to avoid as fully as possible participating in war-making. Others who refuse to pay taxes to the federal government contribute that money instead to human needs here in the U.S., aid and relief work in war-torn regions, peacemaking, or international cooperation. For everyone interested in or actively refusing to pay taxes for war, NWTRCC offers information, referral, support, resources, publicity, campaign sponsorship, and connection to an international network of conscientious objectors to war taxes. 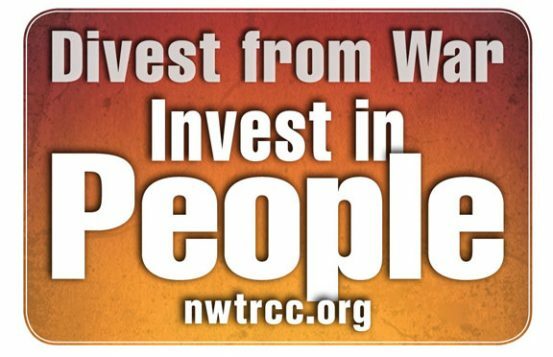 EDITOR’S NOTE: The NWTRCC website is regularly updated with information about protests and events including “tax resistance day”: nwtrcc.org. Their Resource page has downloadable pamphlets and flyers, and they also maintain a Blog on tax resisters and resistance worldwide. Particularly relevant is their page describing various forms and consequences of tax resistance: nwtrcc.org/resist/war-tax-resistance. Our thanks to Roh and the staff of NWTRCC for permission.